Home / would-you-rather / Would You Rather: Save the Earth or Colonize Mars? 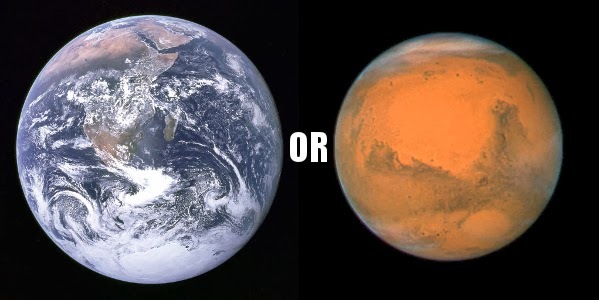 Would You Rather: Save the Earth or Colonize Mars? It's Tuesday, and it's time for "would you rather," where we ask you to make the tough choices. In last week's question, "would you rather talk to animals or extraterrestrials," eighty five percent voted for animals. This week, you decide the future home of the human race. Congratulations! You've won the election, and are now the president of the United States of America. After being sworn in, you're ushered into the Oval Office for your first briefing. Several of your advisers, including the head of NASA, are gathered around your desk with grim faces. They tell you it's time you knew the truth. Humanity is doomed. An environmental apocalypse is inevitable, and will render Earth uninhabitable within ten years. Scientists have determined that the human race has less than six months to put a plan of action in place or it will be too late. They have two proposals. One will be to put all Earth's resources into reversing the effects of the environmental damage. The other will put all Earth's resources into leaving Earth and colonizing Mars. Which would you choose? The United Nations has decided only the US has the resources and leadership to act, so the decision is yours alone. I know it's ethnocentric, but just go with it. You can only do one or the other. You cannot do both. If you try to save the environment, it will require all of the time, money, and resources to develop technology to reverse the environmental damage. Scientists are confident the technology will work, and ensure the survival of humanity. However, it will take all resources devoted to space exploration. The world's space programs will be shut down, and scientists believe it will take decades to restart. With such loss of momentum, scientists believe Mars or even the Moon will never be colonized. If you try to colonize Mars, all of the world's time, money, and resources will be dedicated to building an outpost on Mars capable of sustaining humans. The world's scientists have already developed a revolutionary design that will allow them to rapidly build interlocking habitats on the surface of Mars. They can have the first team sent out within a year, and believe they can build out the outpost into a full-scale city within five years. If all goes well, Mars can support all of humanity within ten years. However, with all our efforts focused on Mars, there will be no resources to save the environment. Earth will become uninhabitable. If you do nothing, the human race will be extinct in ten years. Bottom line: You must decide if the fate of humankind is on Mars or Earth. The way Congress is these days you might as well just move to Mars. Earth - one day it will be Heaven after all. Earth, the Moon and Mars can wait. Mars. While eating Mars Bars.